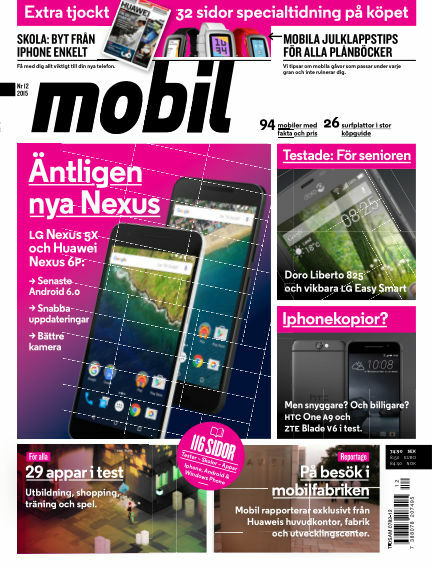 In this issue of Mobil Sverige : Nya LG Nexus 5X och Huawei Nexus 6P med senaste Andorid 6.0. Extra stort nummer med 32 sidor specialtidning om Huawei. Julklappstips för alla plånböcker. 29 appar i test - utbildning, shopping, träning och spel. With Readly you can read Mobil Sverige (issue 2015-12-01) and thousands of other magazines on your tablet and smartphone. Get access to all with just one subscription. New releases and back issues – all included.